Andrew Twidle on rearing honey bee queens, whether it's for re-queening your own hives or for some extra pocket money in the spring. 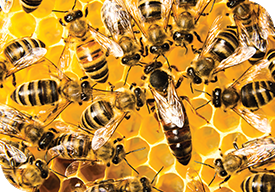 The term queen rearing refers to when a new queen is raised within a hive. In nature this occurs three ways: emergency rearing when the current queen suddenly dies, swarm rearing when the hive becomes overcrowded and supersedure rearing when the workers sense the queen is getting old. Queen rearing is best done in spring time when hives are strong and drones are flying (they are needed to mate with the virgin queen). The extra equipment required for queen rearing is minimal: two empty nucleus boxes, frames, a frame with a cell bar, some plastic queen cups and a grafting tool. Andrew’s preferred method for queen rearing is to mimic supersedure conditions as he believes it produces the best queens. He transfers larvae by hand to the queen cups (called grafting) and uses a hive set-up developed by Ronald F. Van Toor as described in the book Producing Royal Jelly: A Guide for the Commercial and Hobbyist Beekeeper. Here nurse bees are tricked into thinking their queen is getting old by the spatial arrangement of the hive (the queen’s scent becomes weak as the nurse bees and queen are separated). The weak scent then prompts the nurse bees to become motivated to raise a new queen. Once the nurse bees have raised queen cells from the grafted larvae, nucleus colonies can be set up. Note that before you split or share hiveware, ensure the bees are healthy and free of American Foulbrood. If you are not using the nucleus colonies yourself to set up new hives, or for re-queening old hives, the colonies can be sold. Andrew sells his either through word of mouth or Trade Me. He has found a nucleus colony with four to five frames of bees and a freshly mated queen will fetch $200 +, and if demand is high, up to $400! Andrew Twidle is an organic chemist and bee keeping enthusiast.